Since our house is on the market right now, I thought I'd share the photos of some of the "house staging" I've been doing. I'm trying very hard to use items I already have so that I don't spend any money. For the decor that sits on the triangle shelf next to the staircase, I didn't have to spend any money. The butterfly picture was originally on the wall, but we wanted to repair all the nail holes. 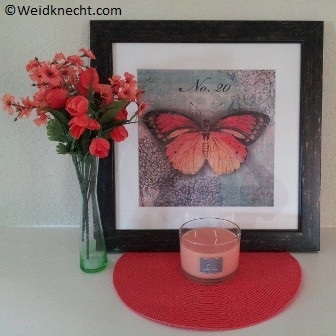 The orange placemat, peach candle, and two orange flower sprays were spring items I bought last year or maybe the year before. The vase was in my kitchen cabinet at the back and I found it when I was cleaning out. No money spent. 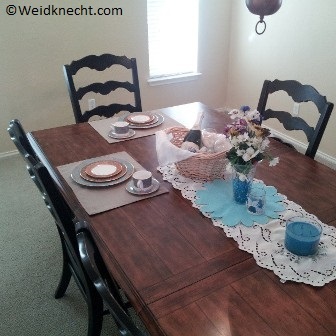 For the dining room table setup, I used a long doily runner that a dear friend gave me a while back; she purchased it in Germany. The blue flower mat and the candles were in a storage box in my closet. I found the two dinner placemats in the pantry in two different places. The dining dishes are the beautiful Lenox pieces I received for a review at Christmas time. The wine basket I made up of existing decor pieces that I used for a cookie review a few weeks ago, plus a gift bottle of wine we haven't opened yet. I did spent $2 on the flowers in the plastic vase. 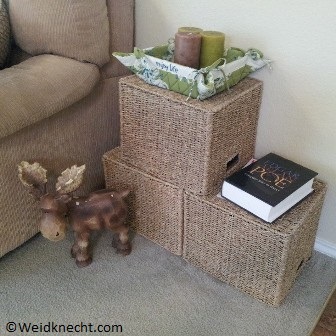 In the living room next to the loveseat, I turned three wicker baskets upside down to make a modular side table. 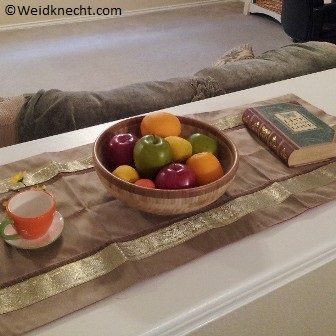 The old candles are perched in a fabric bread basket from an Inspired review last November. The moose was rescued a few years back from a Christmas display at a home store. The Poe book came off our bookshelf. No money spent. The shelf between the dining room and living room is a wonderful long shelf, perfect for staging. The book and teacup came from a sale a few years back at a hobby store. The bamboo bowl is from a Core Bamboo review I did last year, and the fake fruit was purchased about two years ago. The table runner was in my pantry, still in the packaging. Again, no money spent. 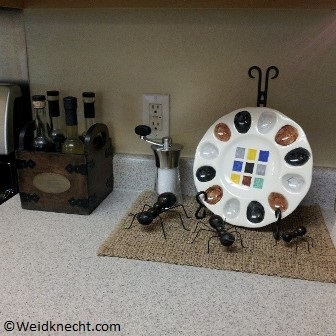 On the kitchen counter, I laid out a placemat and arranged my three iron ant sculptures (a gift from a dear friend) around the deviled egg plate my son made for me years ago. The sea salt grinder is from a review, as is the wooden crate and all the vinegars inside of it. No money spent. 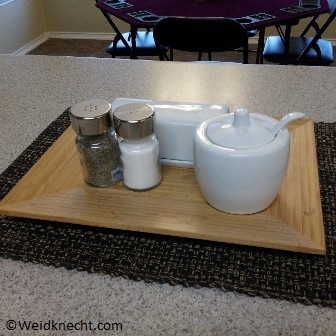 On the kitchen island is another placemat from my pantry. On a bamboo platter from a Pampered Chef purchase about five years ago, I arranged a butter dish, sugar dish and salt and pepper shakers, all purchased a few months back, maybe in January. No money spent here either. I guess I'm doing pretty well working with the items I already have in my house. I've found that simplicity is actually really beautiful.